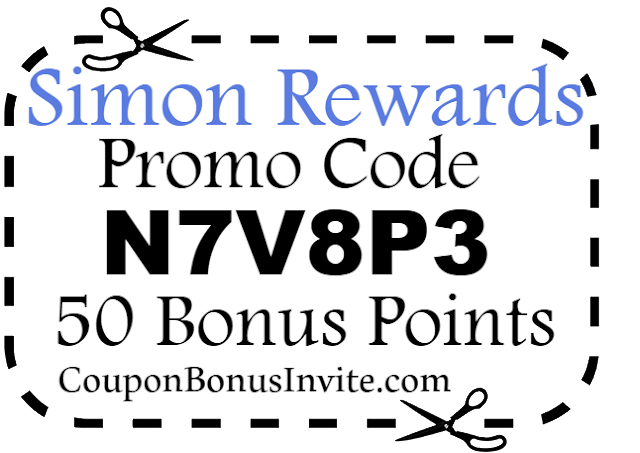 Simon Rewards App Sign Up Bonus, Promo Code and Referral Codes 2018: Earn 50 bonus points today on the Simon Rewards App when you enter SimonRewards Referral Code N7V8P3 when asked. The Simon Rewards App is an app for the Simon Malls. Where you can earn loyalty points for your purchases at Simon Malls. You can earn points for shopping, dining or just visiting the mall. The more you shop the more offers and incentives you will receive on your Simon App. The Simon Rewards is available for the following malls: Woodfield Mall, Orland Square Mall, Gurnee Mills, Ross Park Mall, South Hills Village, Mall of Georgia, Lenox Square Mall, Phipps Plaza, Roosevelt Field, Walt Whitman Shops, Smith Haven Mall and The Westchester. To join Simon Rewards you can sign up here on their website or you can download the app. If you download the Simon Rewards app you can enter Simon Rewards Promo Code N7V8P3 when asked to earn 50 bonus points. To earn points for Simon Rewards, you can either link your credit cards to your simon account or you can submit a receipt using your Simon Rewards App by taking a photo. How does the Simon Rewards Program Work? For each $1 you spend at a Simon Mall you will receive one point. When you become a platinum member you will receive 2 points per $1 spent. With the points you earn you can enter to win prizes.